It is our sad duty to announce the end of Modern Man as we know it. After October 10th our esteemed colleague George Wurzbach will be taking an indefinite leave from performing. “Why is this?” you may ask. Why indeed. Well, there's good news and bad news. As many of you may know, George has been teaching music theory and technology for several years at Monmouth University in New Jersey. As fewer know, it has been a lifelong dream of George's to visit the Antarctic continent and perhaps even have the experience of standing at the South Pole. So the good news is that Monmouth University has generously offered to finance the trip and will send George to Antarctica this fall. The bad news is, that due to budget cuts, the University does not have the funds to bring him back. We will miss him. We extend our sympathies to his lovely wife Lizzie and his proud son Casey, who, when offered the chance to accompany George on this once-in-a-lifetime adventure, thought hard about it for a full second and then replied, "Are you out of your f*#@ing mind?" But wait... there is some good news! We have recorded a new song, "Los Geezers Del Amor," and it is a bonus track on Rob Carlson's new CD Angels on the Radio. The CD is available now at Rob's Online Store. You can also find all of the Modern Man CDs at Rob's Online Store. Enjoy! But wait... there is even more good news! On October 10, 2015 David Buskin, George Wurzbach and Rob Carlson played our last gig as Modern Man at the Walkabout Clearwater Coffee House in White Plains, NY. George's schedule at Monmouth University made it impossible for him to commit to future dates. So after much consideration, David and Rob came to the conclusion that he wasn't replaceable. Whatever Modern Man was, it was the particular chemistry between the three of us, and could not be anything else. We had long felt that our studio albums, while not too shabby, never captured the essence of what we did live. It was all the stuff between songs that made us "a cross between Crosby, Stills and Nash and the Marx Brothers." So Rob asked his old friend Ethan Winer, audio expert and computer wizard to make a video. He recruited cameraman Mark Weiss and with a lot of help from the Clearwater's excellent sound man, Mike Lavery, they created a three camera HiDef video of our final live performance. 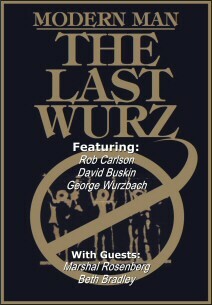 Scorsese did "The Last Waltz" for The Band, they did The Last Wurz for us. So it's ready, already! And just in time for Christmas! Then order your copy at Rob's Online Store. From 1998 through 2010 audiences up and down the East Coast and in such far-flung outposts of civilization as Ohio, Florida and Texas, found Modern Man a delightful change of pace. As Showbusiness Weekly put it: "Buskin, Carlson and Wurzbach should be arrested for being so funny." Or as Back Stage put it: "...these guys are the Thomas Alva Edisons of humor. They're inventive. You know, the bulb goes on." 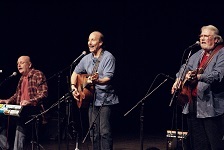 A cross between Crosby, Stills & Nash and the Marx Brothers - David Buskin, Rob Carlson and George Wurzbach are three celebrated singers and songwriters, "terrific instrumentalists with gorgeous voices and hilarious wits." Together they quickly redefined something-or-other and delighted audiences as they interweaved themes ranging from God to Godzilla, from manliness to cluelessness, from ESPN to the FBI with a vocal blend that has not been heard since Ella and F. Scott Fitzgerald went their separate ways. In 1998 Rob was performing at New York’s legendary “Bottom Line” for an album of comedy songwriters when he met songwriter David Buskin. David introduced him to George Wurzbach and the three became Modern Man (joined originally by screen writer Andy Breckman, creator of the “Monk” TV series). Modern Man went on to win Back Stage Magazine’s “Bistro Award” in 2002 for Best Musical Comedy and the 2008 New York Nightlife Award for best comedy group in New York. They performed in clubs and cabarets, coffee houses, concert halls and festivals from Maine to Florida plus Tennessee, Texas and Ohio and Canada. Festivals include the Philadelphia Folk, Clearwater, Kerrville, Falcon Ridge and Summerfolk (Canada). Concert venues include Lincoln Center, The Bottom Line, Town Hall, The Barns at Wolf Trap and many more. 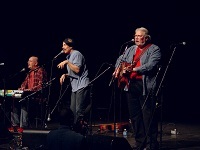 Their debut CD, The Wide Album, recorded live at New York's "Bottom Line", their 2004 CD Modern Immaturity and their 2007 CD, Assisted Living are available on Rob Carlson's Website. In 2010, George, David and Rob decided to pursue other interests. George is teaching at Monmouth State College in New Jersey. David reunited with his old partner Robin Batteau and until March of 2014, they performed as Buskin and Batteau. Rob Carlson is now touring with Vin Pasternak and Paul Peyton as Rob Carlson and the Benefit Street Band. 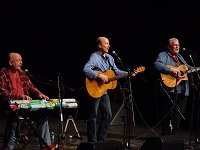 In 2014, David, Rob and George began performing together again as Modern Man. They continued to tour until October 10, 2015.